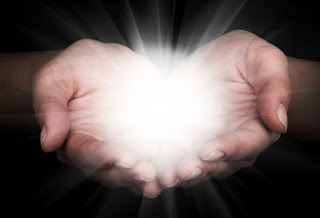 Affirmation: I live a Christ centered life of love, hope, peace, gratitude and compassion. 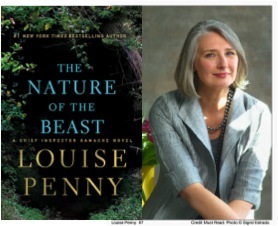 Louise Penny, the author of the crime novels about Three Pines, Canada and Inspector Gamache came to Meredith College in September of this year, 2015 to promote her newest book, The Nature of the Beast. It's her twelfth book in this series. The auditorium was full. I guessed there to be about 300 people there. I became a fan a few years back when one of the women in my book group, Anne Brill, recommended Mrs. Penny's work. My husband, Sandy and I like to listen to a good book if we have an extended drive and I purchased The Beautiful Mystery for us several years ago. We were immediately hooked. We can't wait for our next long trip to delve into the newest novel and to be reunited with the inspector and the rest of our new "friends." Louise didn't really speak about her books because she said she might give away some of the story line which she felt would interfere with her reader's enjoyment. Instead she spoke about her journey to becoming a successful writer. It wasn't an unusual story. It took her a long time and required quite a bit of stamina and also a few serendipitous events. One event revolved around a fundraiser in a foreign country where she met her publisher, the only person with whom she had an encounter during the whole night. Her whole story was interesting but the message with which I came away was about "kindness." She said she modeled the inspector after her husband. If you've read any of her work you will know the inspector is a wonderful man. He is a family man, he cares deeply about his coworkers and he rises above the call of duty to a place of kindness and compassion. What a gift to have someone in your life like that, and especially the person with whom you've chosen to spend your life. I know it's a gift because I too have a husband like that. When she spoke about the qualities these men exemplify she focused on kindness. It was a short sentence but it emphasized to me the power of words. "It is easier to be mean than it is to be kind." Well, I thought, isn't that the truth! Don't you love it when the same message repeats itself in your life? Why, I wonder am I hearing this concept on a regular basis. What is God or simply the Universe trying to tell me? What more am I to learn? Over the last two weeks the phrase, "have courage and be kind" has appeared two more times. I bet you didn't know that those were Cinderella's mother's last words to Ella. 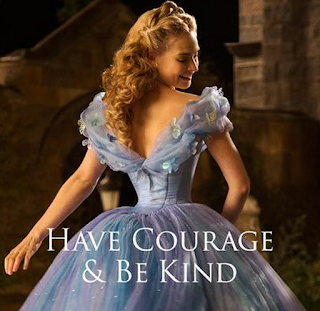 Disney's latest adaptation of the famous fairytale added that phrase. In this edition, Cinderella wasn't simply saved by the handsome prince, they chose to empower her with qualities that enabled her to change her life and still be compassionate. Thank heavens! It seems to me it's so much easier for people to be spiteful, to be right, to be "all about me and not about you." We all recognize when we are being treating kindly. 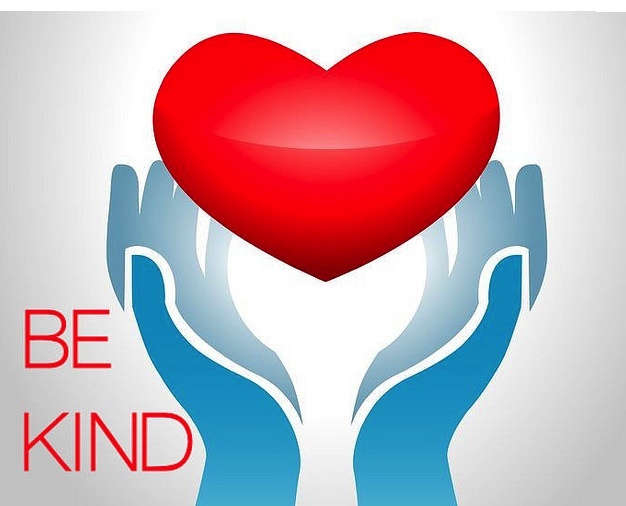 Are we called to be kind to everyone? It seems we are. We are even called to be kind to our enemies. What does that look like? Does it take more energy to be kind than mean or indifferent? Maybe it just takes a different kind of energy. I believe it certainly takes a more conscientious effort to rise to the higher good than to sink to the lowest common denominator. Kindness is a close relative of compassion. Many of the messages I've received lately in several of my readings have revolved around my responsibility to show compassion for the marginalized and suffering of the world. Compassion is kindness put into action. I believe as I age that responsibility becomes even greater. This is a time in my life when I have the luxury of having more time and how I use that time is very important. I want to leave this world a better place than I found it. I must confess there are many days when I look around and can't even imagine what steps I can take to help the world. It helps for me to recognize that I support several projects that reach out beyond my normal sphere of influence to the benefit of those who need exceptional help. I really can't help the whole world but I can do some things that makes a difference or can I? Do you know the story about the boy who is throwing starfish into the ocean? A man comes along and asks him what he's doing and he explains he's saving lives. The man laughs and tells him he's wasting his time; he can't possible save all the starfish. It's not making a difference. 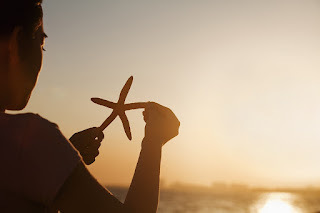 The boy picks up another starfish and throws it into the ocean and says, "Well, I made a difference to that one." My sister, Gloria Hafner, was a specialized reading teacher in NY. She took one or two students at a time and helped them learn to read at or above age level. She always told anyone who would listen about her work and that she had, "made a difference to that one." 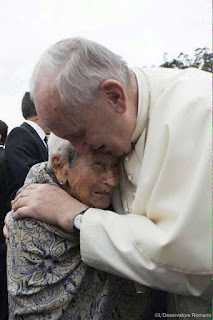 At the time of this entry Pope Francis is about to come to the United States. There has been a lot of publicity revolving around his visit. His approach to the world is causing quite a stir. He seems to me to be filled with love and compassion. He wants us all to fill ourselves with these intentions and then to put them into action. He doesn't want to hear excuses and he doesn't want or be our judge or jury. He is encouraging everyone to hear the message of Jesus and to go forward to make the world a better place. I personally find his message and his example to be refreshing, inspirational and challenging. One of my efforts revolves around my belief in the power of prayer. I pray the Rosary daily for those "who most need God's mercy." I am trusting that my prayers seep out into the universe and relieve someone's pain and suffering. It seems to me there is so much anguish. Perhaps the world is always like it is now and we simply see it more clearly because of the media but what is taking place especially at this time with the refugees from Syria and Africa is beyond tragic. One of the conversations I've had recently revolved around energy and our ability to influence it. The scientist I spoke with didn't believe there was such a thing and that the only reason there was any sort of change was due to a placebo effect. I didn't feel qualified to argue with him but I left feeling very sad. He didn't believe in mystery. He only believed in "mastery." He only seemed to believe in what he could see and touch and prove. I am sure he is not alone but I need "mystery." I need to believe that there is more to this life than what I perceive. I don't believe there will ever be any definite proof that our thoughts and prayers change the world but I truly believe they do. I actually embrace the mystery and imagine one day when I am no longer physically part of this world, being shown how the time and effort I made to send help to others through prayer manifested itself. It'll be my judgment day. I'll see where I failed to rise to the level of a higher plane and where I truly made a difference because I cared and was willing to take the time and make an effort to pray. Maybe that's why lately the words, "courage" and "kind” are appearing together. It may be harder to be kind than mean and kindness is a very important quality to practice but it takes courage to be compassionate. It takes the ability to "suffer with" another and that is very hard. It's so much easier to turn off the TV or to turn away from the homeless and hungry. Pope Francis and now even Disney are calling all of us to step outside of our comfort zone and find a way to help those in need. Perhaps it will be with prayer. 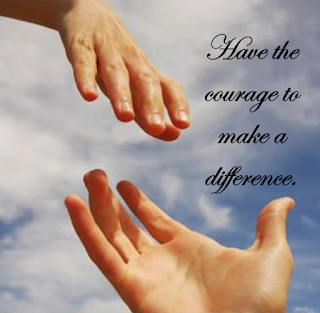 Perhaps it will be only to reach out to one person, someone for whom we can claim, "it made a difference to that one."